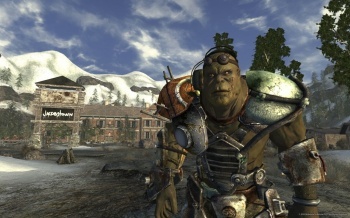 Bethesda has a Christmas present planned for Fallout: New Vegas fans. Well, some of them at least. The release of Fallout: New Vegas draws ever closer. Indeed, for a lot of people it's just hours away, and while most people will have already picked out what system they're getting the game for, a last minute announcement from Bethesda may encourage a few people to change their minds. Bethesda's VP of marketing and PR Peter Hines has outlined what could best be described as a "good news, bad news" situation. The good news is that there's DLC coming for the game, but that bad news is that it's going to be exclusive to the Xbox 360. Currently no other information is known about the content, except that it will become available at some point over the holiday period. "We're excited to continue the partnership between Bethesda and Microsoft, and build on the success of the game add-ons released for Fallout 3 on Xbox LIVE," said Hines. "Fans will once again be able to continue their experience in the Fallout universe with the add-on packs planned for after the launch of the game." It's reasonable to assume that the content will only be exclusive for a limited period, much like the first three DLC packs for Fallout 3 were exclusive to Microsoft platforms for several months. Fallout: New Vegas comes out for PC, PS3 and Xbox 360 tomorrow in North America, on October 21st for Australia and October 22nd in Europe.